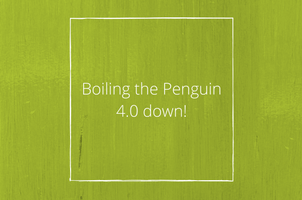 Boiling the Penguin 4.0 down! Google has just released its latest link-spam update famously (or infamously) known as Penguin update in the SEO community. The last update was nearly 2 years ago! What exactly is the Google Penguin update? The Penguin Update was designed to fight spam link strategies and techniques, by keeping an eye on the quality of links pointing to a website. The first version of the update was released in April 2012, and it caused chaos in the digital marketing industry as SEO was heavily focused on link building at that time. Web sites which have acquired links by shady techniques like ‘Link Networks’ were instantly hit. Google kept refining its filter over the years and released a few more Penguin updates. Even if a number of websites had their rankings and organic traffic affected, the Penguin update is a positive update. Websites which were acquiring links in an unnatural way were the first to be affected; cheating the system became harder. So what’s different with Penguin 4.0? Generally, the list of sites affected by Penguin was periodically refreshed at the same time. This time, Google has included the Penguin update in its core algorithm hence making the spam filter active all the time. With Penguin now acting in real-time, the algorithm can catch spammed link profiles in a more efficient way and affect them quicker too. In the past, a number of websites were able to get away from Google penalties for a relatively long period before getting caught by the next Penguin update. This will no longer be the case; websites will now pay the price of having spammy links immediately. Furthermore, Google is saying that it will no longer announce future Penguin updates, given that it will always be active from now on. This is really big news since there’s still a lot of Black Hat SEOs out there using spammy tactics to build links to their websites. In fact, even though Google claims that black-hat tactics do not work anymore these days, there is a lot of evidence that points to the contrary. On the other side, websites that have been affected will now be able to recover from a Penguin hit quicker than before. It will now all depend on how much effort the website owner is putting at cleaning and keeping his backlink profile healthy. Any changes will be visible much faster, i.e. at the next crawl and Google index. The new update affects web pages rather than entire websites. Historically, entire websites were impacted by Penguin if they didn’t have a good back-link profile. This time, only the specific pages or sections with bad links will be affected, which is excellent news since a website can still keep good rankings for pages that do have good links and not losing all of its organic traffic. SEOs will now have to analyse backlink profile at a more granular level. Since Penguin is now working in real-time, it will be increasingly difficult to identify whether a drop (or improvement) in rankings can be attributed to Penguin updates. Google algorithm is known to have about 200 factors affecting a website’s rankings, meaning SEOs will need to double up their efforts at analysing backlink profiles. This update is ‘fairer’ as website with good content and good links will benefit instantly, whereas websites which cheat the system will instantly be penalised. Data-driven SEO will become even more important. Links auditing should be performed on a more frequent basis and at a more granular level, e.g. Links could be classified and analysed by type, category, section and pages. This is essentially because the Penguin update now acts at a more granular level. E-commerce websites, for example, would need to double up effort at understanding the value and impact of incoming links to the different sections on the site and how they are impacting the site’s performance. Website owners and digital marketers should focus on building quality content rather than putting effort at building links. Our aim should be to build the brand further, rather than building links; creating the right type of content, telling the right story to the right audience. Contact our SEO solutions team today to find out if your website results are affected by Penguin 4.0 – 020 3930 5378.